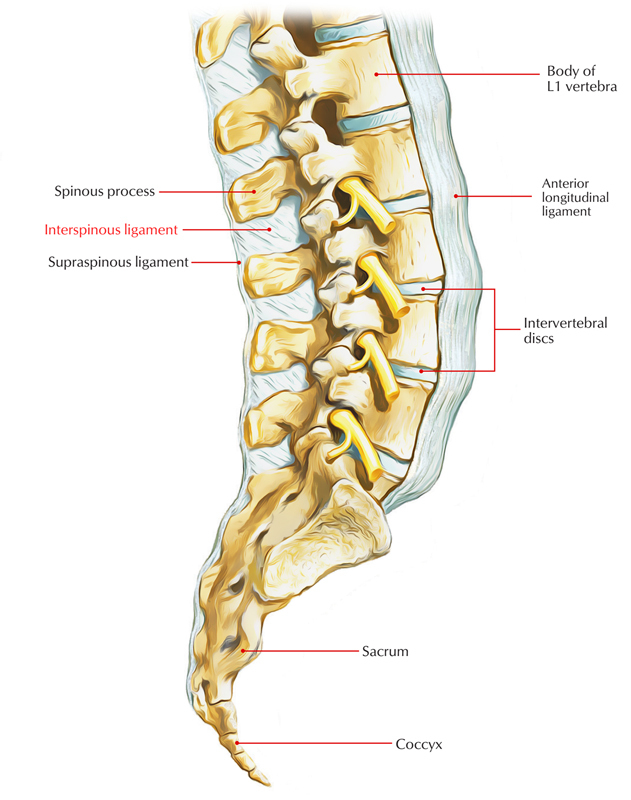 The interspinous ligaments receive an innervation from the medial branches of the lumbar dorsal rami. The interspinous ligament is a striking source of low back pain. 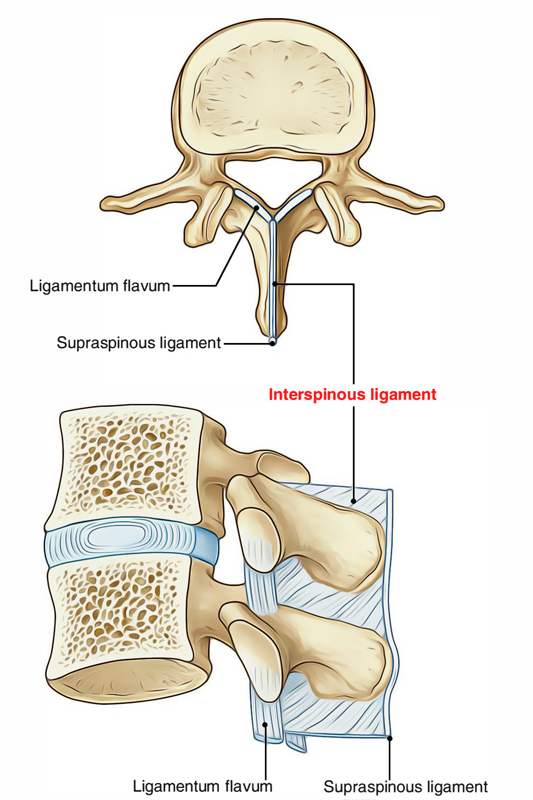 It has a fan like shape with the narrow point of the fan blending with ligamentum flavum. The interspinous ligaments attach adjacent spinous processes from their roots towards their apices. The collagen fibres are parallel towards the spinous processes before spreading in a posterocranial and posterocaudal direction, in the centre of the ligament, in order to attach with adjacent spinous processes. The spinous processes can divide at the time of flexion due to being facilitated by the fan-like direction of the fibres of interspinous ligament. The direction of the central fibres facilitates the conduction of forces, and they transmit the anteroposterior draw of the thoracolumbar fascia. Interspinous ligaments travel in the middle of neighboring vertebral spinous processes. They join from the base towards the top of each spinous process and merge together with the supraspinous ligament posteriorly along with anteriorly the ligamenta flava on each side. The interspinous ligaments attach neighboring spinous processes from their roots to their tips. Give origin to Lattisimus dorsi. The interspinous ligaments can often get ‘degenerated‘ in their central parts. Then, it is conceivable that following excessive flexion of lumbar motion segments interspinous ligaments might be subject to strain. Hyper-flexion may injure an interspinous ligament and if it is very powerful, then can create tearing. Weak back muscles may be unable in order to control flexion, specifically at the time when the flexion movement is rapid and if this happens frequently, this may create a sprain of the interspinous ligament.